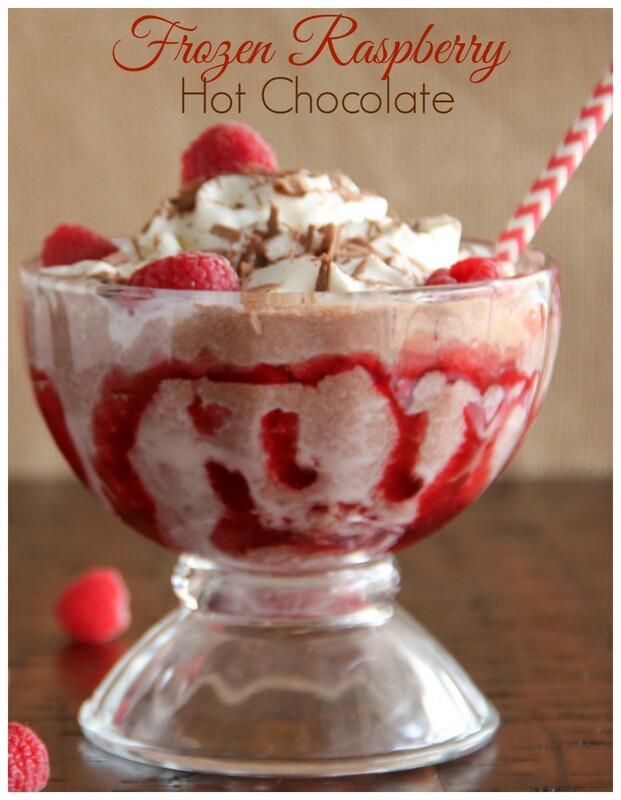 This frrrozen hot chocolate blend paired with a delicious raspberry sauce makes for a delicious after dinner treat! How can you go wrong with the flavor combo of dark chocolate and fresh sweet raspberries?!?! I really didn’t need a special reason to make this luscious drink but I’ll go with the fact that today is Hot Cocoa Day in…Brazil. I know I’m reaching but any excuse to make it works for me! I love to enjoy a great hot chocolate especially in the fall and winter but as the weather warms up, here’s a great solution to enjoying the decadent drink throughout all seasons in a chilly way. The key to a great hot chocolate starts with using a GREAT chocolate base. Remember my friend, Ghirardelli? Well, he makes it to the stage for sure. Half and half also plays an important role in this decadent treat and of course, the raspberry makes a cameo appearance. Start by combining 1/2 cup of raspberry jam with 1 T. water in a saucepan over medium low heat until smooth. Then mix 1/3 cup of sugar, 1/3 cup nonfat dry milk powder, 3 T. Ghirardelli cocoa powder, 1 T. Hershey’s cocoa powder and a pinch salt in a small bowl. Pour the half and half into your blender and add the chocolate powder mixture. Toss in 3 cups of ice, 3/4 cup of fresh raspberries and bend until the mixture is nice and smooth. Decorate two sundae goblets with the raspberry sauce then pour equal amount of the frozen hot chocolate into your goblets. 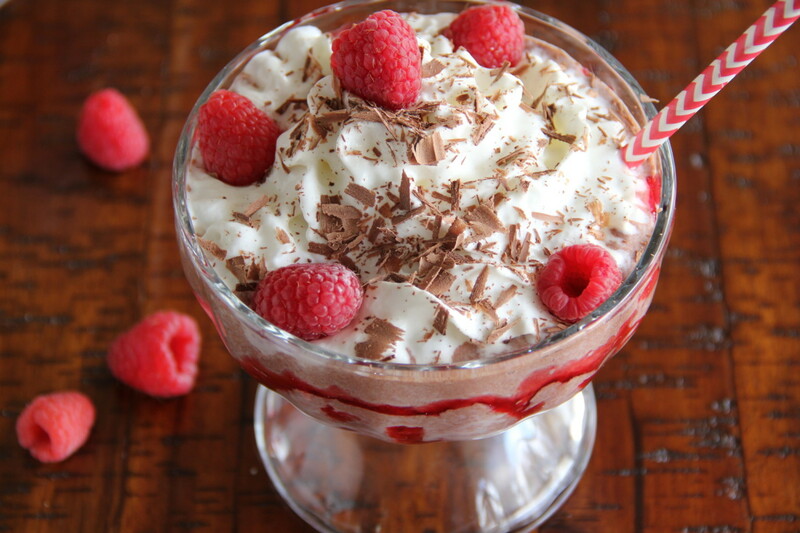 Garnish with whipped cream, chocolate shavings and fresh raspberries. Drink with caution otherwise, a brain freeze is inevitable. I speak from experience. 🙂 Say Grace and enjoy! Raspberry Sauce - Combining raspberry jam with water in a saucepan over medium low heat until smooth. Mix sugar, nonfat dry milk powder, Ghirardelli cocoa powder, Hershey's cocoa powder and a pinch of salt in a small bowl. Pour the half and half into your blender and add the chocolate powder mixture. Toss in the ice, raspberries and blend until the mixture smooth. 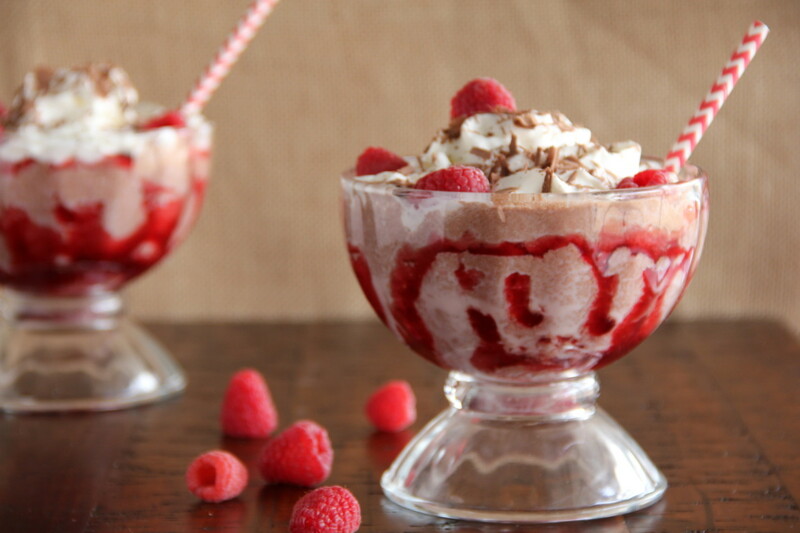 Decorate two sundae goblets with the raspberry sauce and then pour equally into goblets. Garnish with whipped cream, chocolate shavings and fresh raspberries. Say Grace and enjoy! I didn’t realize there was a location in DC. I wish I would have know that when I lived there. The peanut butter option sounds delightful!! Thanks for stopping by! This is so pretty and delicious looking! I could use a frozen treat like this right now, pinning! Thanks Sara! Be sure to let me know what you think! What an incredible combination. Now for me, I would be more satisfied with kind of sweet rather than candy. I love great chocolate and this would absolutely fulfill that craving. I always felt that something smooth on the tongue took the dessert to a higher level than plain cake. Great recipe!! Ummmm I need some of this pronto!! These are so cute and look super delicious! This looks very tasty! Raspberries are my favourite berry. I wish they were in season longer!